Salmon River in Truro, Nova Scotia. The rain just kept coming down yesterday, so we ended up staying in Windsor for an extra night. There was no point in travelling and missing out on photo opportunities especially when we have a lot of other work to catch up on. Today luckily dawned brighter, so we packed up and headed off. 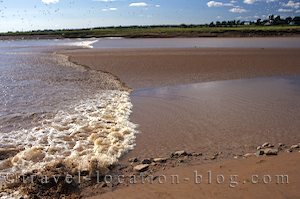 We planned to try and time our travels to watch a phenomenon known as a tidal bore. A tidal bore happens when an incoming tide forms a wave or waves which travel up a river or bay on top of the out-flowing current. A popular activity (and tours) around these parts is surfing, rafting or kayaking the tidal bores. Tidal bores happen in various places around the world including the Bay of Fundy because of the extreme tides there. The next one wasn't due to happen until around 2pm (tide change) and we decided to watch it in South Maitland at the Shubenacadie River - they arrive at different times depending on how far up the Bay of Fundy a river is. We connected with the Glooscap Trail which is also part of the Fundy Shore Ecotour - two themed driving routes. We reached the town of Walton and drove out to the lighthouse (built in 1873) which offers stunning views of the Bay of Fundy. The vivid red mud flats were exposed due to the ebbing tide. Next stop was the Burncoat Head lighthouse which is also stationed along the shores of the Bay of Fundy and is the site of the highest tides in the world - reaching 16 metres high. A little before 2pm we were driving into the village of Maitland near the mouth of the Shubenacadie River which is the longest river in Nova Scotia and apparently one of the best places to see a tidal bore. We pulled into a car park where there was a lot of activity - people hurrying about and getting ready to head out on the river in their kayaks and ride the tidal bore. After a few enquiries, we were told that the best place is actually up river further. We got back in the truck and continued upriver to where there is a viewing platform - part of an old abandoned railway bridge. Unfortunately a local organisation has blocked off access to the bridge except via their building where you have to pay a fee (which is incidentally on public land). It was a minimal fee, but out of principal we refused to pay it and found another location from which to watch the tidal bore (only a few hundred metres away). Having travelled to many locations in Canada such as this, we are pretty fed up with paying a fee to access public land. The fee is apparently to pay for the interpretive signs and information centre but generally the freedom to choose is taken away - what if we don't want to read the signs or stop at the information centre? We just want to see the bore! We walked towards the road bridge and took a side driveway which lead under the bridge and found a family group having a whale of time .... in the mud!! The steep red clay/mud banks make a perfect slide to the river below, they were covered from head to toe in mud but they were having a blast! With the tidal bore soon to arrive, they all had their last slide and stayed down to wash off the mud in the Shubenacadie River, then we all stood at the top of the bank waiting. With the arrival of the first zodiac then a jet-ski rider we figured it wasn't too far off. We'd visually marked the water level on one of the bridge posts and were watching constantly - but it was a let down. There was no real wave just a surge of water which suddenly starting filling the river beds and raising the water level. After waiting for over an hour - it turned out to be nothing special! However, all was not lost - there was another chance! We could drive to Truro and see if we arrive ahead of the tidal bore travelling up the Salmon River - it was a long shot but we decided to go for it! This time we had success, but at first we thought we'd missed it. We pulled into the car park and had to ask around to find out if the bore had swept through or not - it hadn't! We only had to wait about 20 minutes when we saw it - a wall of water sweeping up the river, smashing against the banks as it takes a curve. It was an amazing sight and shows the power of the Bay of Fundy tides! With success under our belt, we left Truro and continued around the top end of Cobequid Bay (one arm of the Bay of Fundy). Our destination was to be Cape Chignecto or more precisely Cape d'Or Lighthouse for sunset. The sun set in grand style that night and the lighthouse itself as well as the steep cliffs below it made for a beautiful setting. Our camp site that night was real waterfront - along a narrow spit of land fringed almost entirely on all sides by water. The Old Shipyard Beach campground comes highly recommended and is situated in Spencer's Island, a small town along highway 2. We had to backtrack a little from Cape d'Or but it was worth it. Compared to the site we had at Parker's Cove near Annapolis Royal (where they wanted $95.00 for a waterfront site) we paid $20.00 for literal waterfront with power and water connections. That's what we call a bargain!